Gabby O’Connor is an artist and interdisciplinary researcher. Her work ranges from landscape scale installations, through room-scale icebergs, and to photographing the smallest ice platelets. Her work is process based, often involving communities and children. 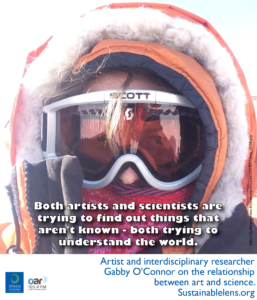 After several years of imaginatively exploring the space and place of Antarctica, Gabby recently spent time there as an artist embedded in a research team. We are joined also by Bridie Lonie and talk about Gabby’s work and the role of the interdisciplinary researcher in both communicating and perhaps influencing the science of understanding our world. We also talk about seal snot. It’s an experiment within an experiment to see if art could in turn influence science. It’s a stereotype that there are scientists and there are artists, the process is often quite similar. It’s like a Venn diagram, the art intersecting with the science, then there’s this education component. They can each operate separately, but in together combination the power is just just massive. That’s that really exciting unknown space…we’re really enjoying pushing all the disciplines a little bit further. Tensions? There’s a lot of trust because it’s a relationship built over time. Both artists and scientists are trying to find out things that aren’t known – both trying to understand the world. Scientists are trying to find small pieces of a puzzle that will help explain and prepare us for Climate Change, and I’m using many small fragments of information to try and tell similar stories. (Activist) No, but, not protesting. Really good information, connecting with children is a really good investment. (Motivation) I’m an artist, impractical…maybe practical and imaginative. I’m in a unique position at the moment where all my interests have intersected in a most perfect way. (Challenges) Turning data into newer things. (Miracle) Lost of time, dedicated space, great conversations.